One of our favorite soups --it's high protein, high fiber and hearty enough to be a meal itself! Easy to make, packed with nutrients & Delicious! I can’t tell you how much we LOVE this Veggie Bean Sorghum Soup! We’ve been making a version of this soup for years. 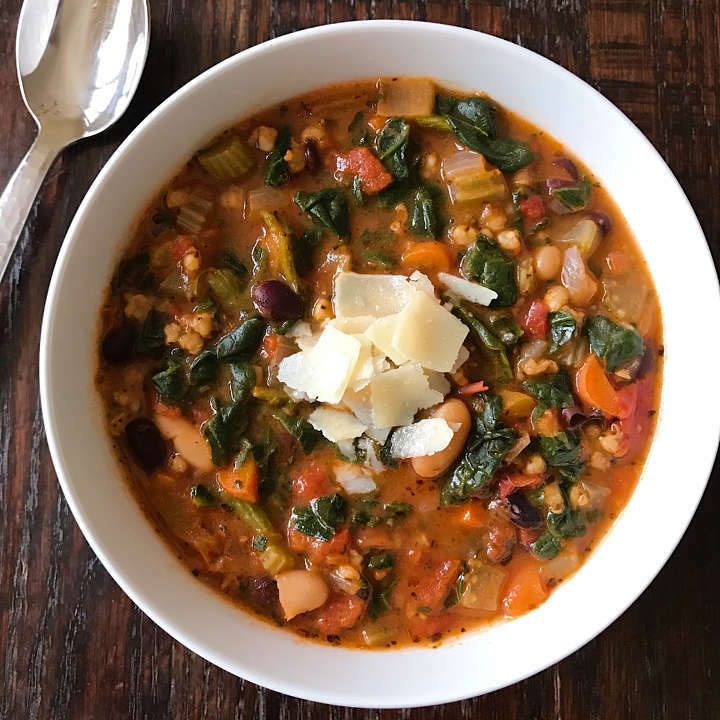 The original recipe was a Veggie Bean Barley Soup, but once my son was diagnosed with celiac we stopped cooking it with barley because gluten is found in wheat, barely and rye. We made it with just the beans and veggies and it was still yummy but not as hearty and sometimes we would add gluten-free ditalini which was good but not the same. When we tried sorghum a few years ago, the first thing my husband and I both said was we had to try sorghum in this soup. Sorghum is a gluten-free grain packed with protein, fiber and tons of vitamins and minerals like niacin, riboflavin, thiamin, magnesium, iron, calcium and potassium. Sorghum is mostly flavorless and takes on the flavor of the soup, and it is slightly chewy and holds it’s texture so it works perfectly in this soup. Not only is this soup super easy, healthy and tasty, but it makes a huge quantity so you get a great meal plus extra to freeze for another day. Serve with parmesan if not dairy free. Soup is great on its own or alongside pizza, grilled cheese or a simple green salad. A hearty, high protein veggie-packed soup. Perfect on it's own or alongside pizza, grilled cheese or a simple green salad. Makes a large quantity and freezes well. Bring to a boil, reduce heat and simmer for 2-3 hours. (The sorghum takes a long time to cook but holds it's form and takes on the flavor of the soup). NOTE: the sorghum absorbs a lot of water as it cooks, so feel free to add more water to the soup as needed or desired. When ready to eat, add the spinach (or kale). So good! Made it for dinner and everyone liked it (except youngest child but she’s picky). Didn’t have sorghum but used some barley and also a sweet potato and regular potato. Looking forward to leftovers! Thanks Sarah! So happy you loved it too! Kids of all ages can be picky so I get that:) And the original recipe actually called for barley but since it’s not gluten-free we use the sorghum now…. Potatoes sound like a yummy add! Oh, my God! This dish is the best! I just had it for lunch. My daughters do not like the healthy meals I make (yet), but they were delighted with this! ❤️ Thank you so much for all these wonderful recipes! So happy you love it! And even happier that your girls love it too! Thank you for sharing! Perfect soup! Great recipe! Just left out the sorghum. Very hearty & full of delicious flavors. My twin 7-yo’s both enjoyed it too. Will definitely make again & again. Thank you! Thanks! It’s one of our favorites with or without the sorghum! And so happy your twins liked it! I’ve never used sorghum, is it used to thicken? I made the soup this way, with gluten free shells. I added them separate at the end like you mentioned. It was yummy! Perfect meal for a snowy evening. Perfect snowy evening meal! So glad you liked it! If you knew you’d eat the entire pot of soup, you could cook them when ready to eat directly in the soup, but for us, cooking them separately really helps with leftovers and keeping it fresh! If I don’t use sorghum is the cook time for the soup different or the same 2-3 hours? Great question! The longer the soup cooks the more the more tender the veggies and the more the flavors come out but soup could be ready in a hour without the sorghum! I would just sauté the carrots, celery and onions a bit longer so they are really tender before adding in the rest of the ingredients.n Let me know if you try!